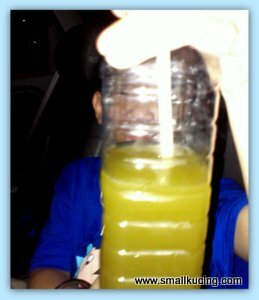 SMALL KUCING: Honey Lime Drink for Sore Throat? 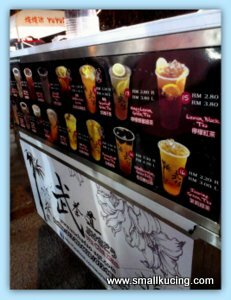 Last Sunday Mamarazzi went to Pasar Malam(night market) and was surprised to see the Honey Lime drinks stall that she usually buy from had "expanded". Added a few more "machines". She likes this Honey Lime Drink coz good for sore throat. 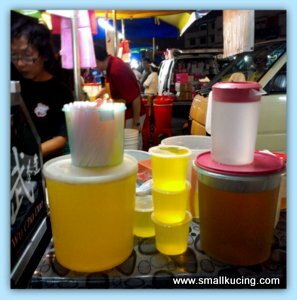 The Uncle would put some jelly inside then some crushed ice and some sort of Lime Paste into the cup then shake shake a bit. 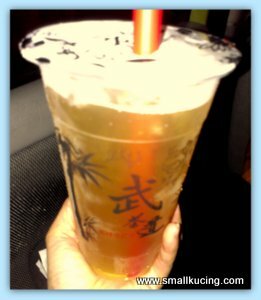 Now instead of cap, the Uncle used a plastic thingy to seal the cup. Mmmm...since the Uncle have some new drinks, Mamarazzi decided to give it a try. She had Green Tea With Honey Lemon. This one does not have jelly. She said it tasted good. Soothing to the throat. As for me....I feel like having Sugar Cane juice. Super sweet. I got sore throats also last week. And then comes with flu and coughing. Full packages. hehe... I think the weather is not so good at the moment.. Get well soon mamarazzi! Honey lime is good. They say sugarcane is heaty - dunno why. Always thought it's cooling... Maybe because of the hig sugar content. Honey lime tastes good. I would love it to quench my thirst..
Meow, I love honey lemon more. I always make honey lemon juice at home. nice so lime is also for the throat? I like honey lime drink. Especially with lots of ice. honey lime.. actually i realize there are two types of honey lime to be exact..
one is the chinese style with preserved lime, one is the western style fresh lime with honey.. i guess yours is the former one?? yes, i actually love honey lime drink (chinese version) too, very soothing for the throat and refreshing too.. best is to add sour plum into it, taste even nicer..
Chinese version, ang moh verion both also nice. But for sore throat think Chinese one works better coz got salty taste a bit. Perfect timing! I'll try this for mine. I've been on vacation, and that's why so absent, but all of the travelling has caught up now I think. Still had fun though! Honey lime drink sure refreshing! I like to drink lime or lemon drink too but without any sugar. It wakes me up really well with its sourness.